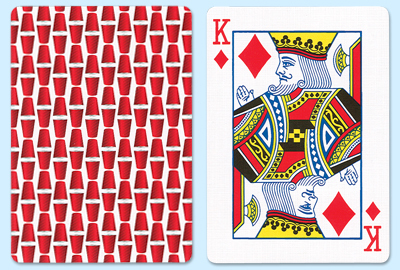 Bicycle Red Cup Playing Cards feature the Red Plastic Cups that you've drank from at so many fun events. First introduced in 1972, Red Plastic Cups have become an iconic symbol of socializing and get-togethers. Bicycle Red Cup Decks feature a unique back design with a Red Cup pattern, special Aces, and standard faces for all other cards in the deck. Like regular Bicycle Brand Playing Cards, Red Cup Playing Cards feature a patented Air-cushion® finish, softly beveled edges, and sandwich construction for superior card play. Bicycle Red Cup Playing Cards are available for immediate shipment.